We know buying a puppy can be daunting and complicated. We try to make it simple but there are many aspects to the proess at Banksia Park Puppies. Here is an in-depth explanation of the methods in which you can reserve or buy your Banksia Park Puppy. Feel free to email us if you’d like more steps included or information about the process! So after long and careful consideration, you’ve decided you’re ready to love and care for your new puppy. Puppy ownership is a big and lifelong responsibility which takes planning and commitment but is extremely rewarding. So with an abundance of puppy facts and information we have collated and writen lots of information on our website and blog to help you identify the best puppy for you and your family. Which breed suits my family? Learn about each of the puppies we specialise in and their relevant information. You can view on our website or also come in for a conversation with our Puppy Consultants to learn about our breeds and which would suit you and your family's lifestyle the best. View photos of what each breed looks like when grown-up. Our customers/extended family have kindly provided photos of our puppies and dogs living pawsome lives! You can view our ‘Grown-Up’ Highlight Story on Instagram or #banksiaparkpuppiesgrowing to see growth comparisons of our customers’ dogs from when they were puppies to older dogs! What do I need for my Banksia Park Puppy? Our Puppy Consultants are on-hand to help you through the process – from choosing your pawfect puppy to selecting any doggy accessories you’ll need. What is the Priority List? The Priority List allows you to view our puppies at 6 weeks old before the general public. Puppies can be viewed with photos and the relevant information on our webpage to make choosing your puppy convenient and easy. For each puppy breed we specialise in we have a corresponding Priority List. This allows you to view just the puppies from the breed you want and also helps narrow down the waiting time! To join all you need to do is click here, follow the prompts to create an account and become a member. To then become an active member a $100 deposit via Paypal is required. 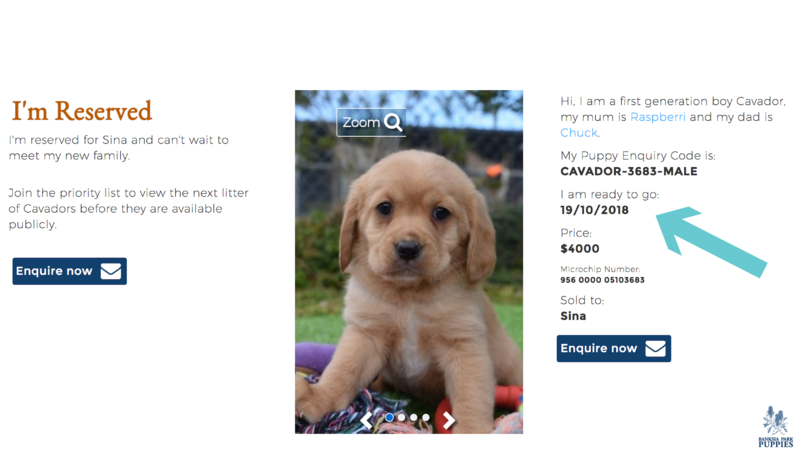 The deposit is required to show that a customer is genuinely interested in purchasing a puppy from us, but it is also fully refundable should you not follow through with the puppy purchasing process. How do I move up the Priority List? The Priority List is in chronological order, so if you join today you will automatically be added to the bottom of the queue and will be sent a confirmation email that you are now an active member. Even though you will be placed at the bottom don’t worry it will only be temporary. You will still have a chance to view the latest available litters once customers higher on the list have had their viewing time and if there are puppies ‘Available’ you will see those too which does often happen. You will then be moved up a spot each time a customer above you has reserved and purchased their pawfect puppy! How does the list work on a Saturday? Each Friday that we have 6 week puppies in your selected breed you can log in to your account and see your provided activation time. The customer who is first on the list has access at 9.00 am on the Saturday (AEST and AEDT) and the list is then deactivated at 3.30 to 4.00 pm. The more people on the list, the shorter viewing time each member has before the next member’s activation. If a customer would like the ‘pick of the litter’ they are more than welcome to wait until they are at the top of the list. You may be wondering what happens if you’ve been waiting for your activation time on a Saturday, you log in, only to find out that all puppies have been ‘Reserved’. We understand that this can be frustrating, but it’s great to remember that as this is a fair queue-system; every time someone above you on the list reserves a puppy, you are a place closer to the top. 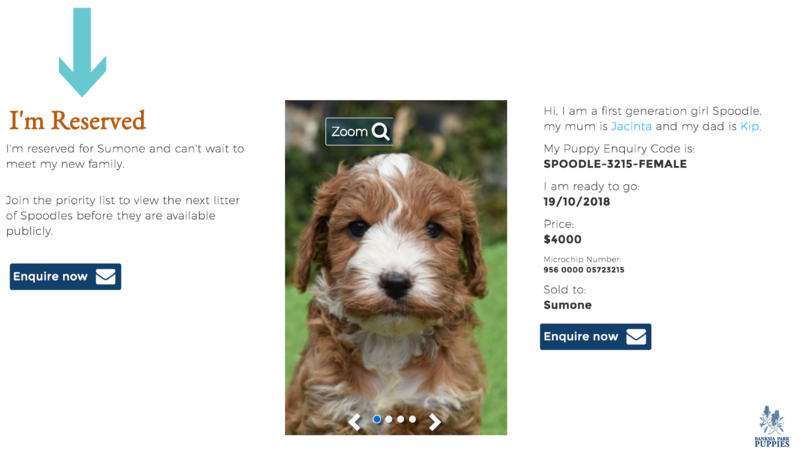 If you’re keen to buy a Banksia Park Puppy but aren’t sure about joining our Priority List don’t worry; you don't have to be on a waiting list to purchase a puppy. You can view our Public Listing on our website at any time and click the ‘Reserve Me Now’ button or call 1300 255 277. The latest litters and puppies which aren’t reserved through the Priority List on a Saturday are released to the general public on a Sunday, which is good news for all. The ‘Reserve Me Now’ button will secure that puppy for you. One of our helpful puppy consultants will contact you within 24 hours to help you reserve that puppy (make sure you know the ‘Puppy Enquiry Code’ as they will want to know this!). The ‘Reserve Me Now’ button with the arrow on the button will open up into a Contact Form (below). Here you fill in your details and will then be contacted by one of our Puppy Consultants shortly afterwards. You’ve ‘Reserved’ a beautiful Banksia Park Puppy…so what happens next? What happens at our Puppy Information Centre? You may be wondering why we arrange puppy pick-ups from our ‘Information Centre’. A politically based Bill was passed late last year in Parliament which affects the dog breeding industry and pet shops of Victoria! The new legislation prohibits the selling of puppies and kittens from ‘Pet Shops’ in Victoria. 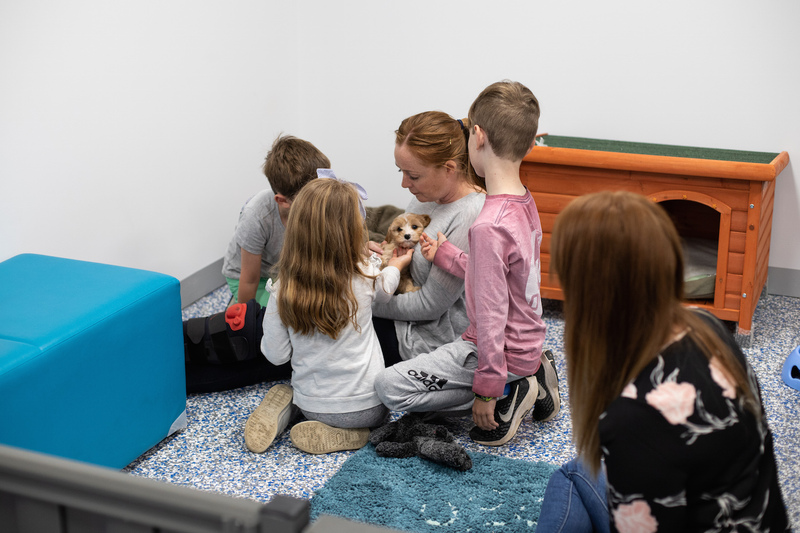 Our Information Centre complies will all new legislation and is strictly involved in only the consultation and support process, as well as the handing over of our puppies to their new families. Puppies are not kept or homed at the Information Centre but instead safely delivered to the puppy-friendly facility via a climatised van and only when the puppy is fully sold and paid for by the family. No available puppies are held at this location to comply with the legislation and although this is not convenient for many families, unfortunately it is not something we can change. For these reasons, Meet and Greet pick-up times are by appointment only and held on the designated delivery days. 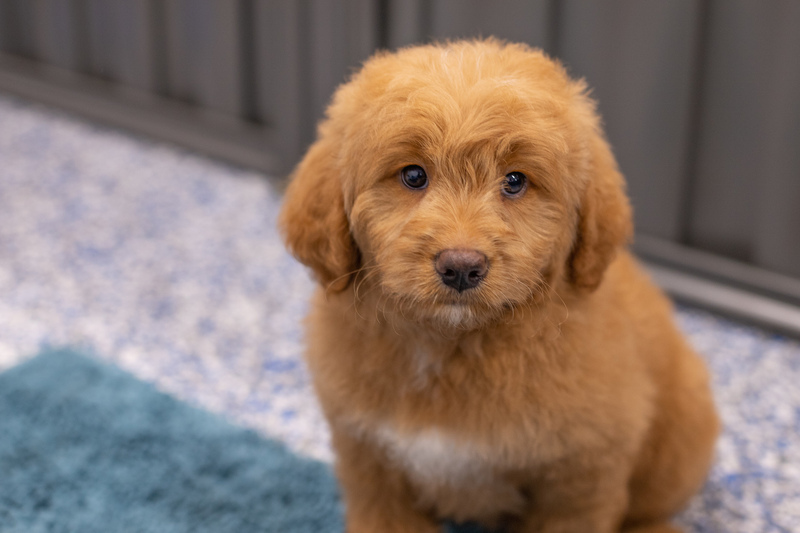 If for some reason a puppy owner does not want to follow through with the pick-up of their chosen puppy at their Meet and Greet time, you can be fully refunded and the puppy will be transported back to our Banksia Park Puppies breeding facility in Stradbroke, Victoria. To operate within the boundaries of the new state law, we must receive full payment for any puppy before it leaves our property here in Gippsland. This can be paid by direct transfer, Bpay or credit card. 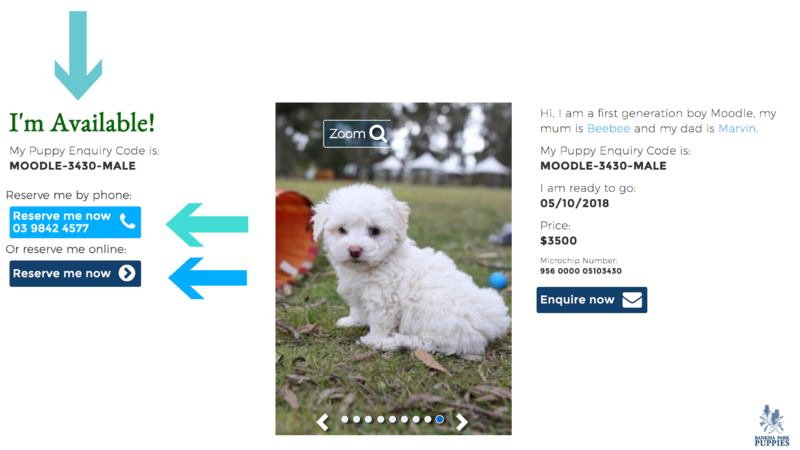 In the unlikely event you are not 100% happy with your puppy when you meet (for any reason whatsoever) the transaction will be reversed and your payment refunded in full immediately, via the same payment channel you used. When can my puppy be picked up? Arrangements need to be made for us to keep the puppy beyond this date and this is strongly discouraged given the importance of time that this is both for your family as well as your new family member. Congratulations, you are now the new pawrent of a beautiful Banksia Park Puppy! We hope you share many happy memories and milestones together. Share with us your pawfect puppy moments on Instagram, Facebook or email. Remember we are always an email or call 1300 255 277 away if you need help before, during or after the Puppy Purchasing Process!